This past Sunday, 85 Volunteers teamed up and tackled 15 different shorelines by land and by boat in an effort to collect as much debris as possible. 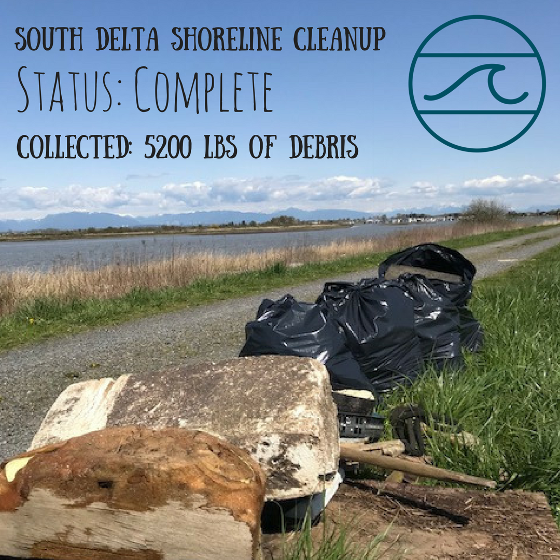 We were treated to some fantastic weather from Mother Nature during the event, and clearly we needed all the help we could get, as we removed 5200lbs of material from our shorelines. We were completely humbled to see the community come together like this. In one way or another, our overall happiness is connected to a healthy environment, and the healthier our environment, the happier we will be. This event could not have achieved such monumental results if not for the efforts of these two companies. 505-JUNK was able to collect and weigh all of the gathered debris while efficiently moving it from strategic drop off collection spots to Wellington Point for final pick-up by the City of Delta. There would have been no possible way to effectively move that much material without the help from Alex @ 505-JUNK. In cooperation with Alex, Ben Lyons went out of his way to donate his time and vehicle so that he could attend to various drop off locations to make plenty of productive trips. These two gentlemen also spent numerous hours with me collaborating on the logistics of the event which led to our overall success. BIG THANKS!!! The city of Delta was on board from the onset of this event and offered us all of the litter pickers, bags, and most importantly, the pick up of all collected material from Wellington Point Park. Jess Graham contacted me shortly after noticing our post for the event and immediately offered to provide coffee for all participants. Her and Jasmine were such a welcome addition to the event and we can't wait to see them again next year. Dulux graciously donated all of the latex gloves while White Spot provided 2-$25 GCs into our gift draw. Thank you to Ambiente South Surrey for the earth friendly gift basket and to Ambiente Tsw for the generous GC. Both of these local businesses provided us with some energy in the form of a breakfast before the event. Thank you to Thrifty Foods for all of the muffins, and to Tim Hortons for the timbits. Both were a welcome edition to the event. Without hesitation, they donated 6 bags of garden soil and 220 pots to plant the 220 Cedar Seedlings. From the beginning, they were willing to let the community know what we were planning and were also in attendance on the day of the event. Thanks so much for helping us spread the word for this event. This incredible team consisting of local talent, provided assistance in the preliminary planning stages that allowed us to make something out of an idea...plus an on the fly logo for the event that proved to be a recognizable symbol of our local shorelines. Everyone and anyone who went out of their way to personally share, tag, like and comment on our post on social media. Many of these people were complete strangers to us, yet felt the need to get behind such an important event. We are very grateful for the support and look forward to next year's event. All of the VOLUNTEERS...we've struggled to even put into words how to best describe what this event was because of you. Together we pulled off an amazing feat and this event's success was only possible because you graciously donated your time and energy in order to maintain a clean, healthy, local environment. ***Check out the event pictures in the South Delta Shoreline Cleanup album on our Facebook Page. We are already receiving great feedback and are working towards making it an annual local event to celebrate Earth Day in our community. Really look forward to seeing everyone next year...we have done an amazing thing this past weekend and I know we will continue to work together for many years to come.